This dessert uses red skinned Empire apples which have a crisp white flesh. Empire apples are also good chopped up in salads or eaten on their own. If preferred, you can use this recipe to make four individual tarts instead of one large one. Roll out the pastry and cut out an 18cm (7") diameter circle. Place a sheet of Teflon Cooking Liner on a baking tray. Prick the pastry lightly with a fork and place it on the Cooking Liner. Roughly chop the pecans and scatter over the pastry. Leaving the skin on, quarter, core and thinly slicethe apples. Melt the butter, stir in the lemon juice and toss the apple slices in the butter. 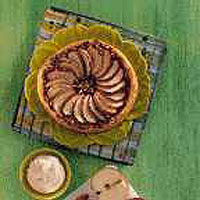 Arrange the apple slices on the pastry in overlapping circles, not quite to the edge. Sprinkle with sugar and place in a preheated oven 220°C, 425°F, gas mark 7 for 20-25 minutes or until the pastry is crisp and the apples slightly browned at the edges. Meanwhile whip the cream, fold in the maple syrup and cinnamon. Refrigerate until needed. Serve the apple tart warm with the flavoured cream.